Fig. 1 The parallel plate particle separator developed by Okuda et al. (2015a). Fig. 2 Schematic of the parallel plate particle separator and classification of aerosol particles. Fig. 3 Trajectories of 100 particles in the case of 100% flow rate and 72% flow rate. Fig. 4 Trajectories of 100 particles in the case of 100% flow rate and 72% flow rate around the inlet section. (1) Ahn, K. H., Sohn, S. H., Jung, C. H. and Choi, M., In situ measurement of nano particle size distribution and charge characteristics in H2/O2/TEOS diffusion flame, Scripta Materialia, Vol. 44, No. 8-9 (2001), pp. 1889-1892. 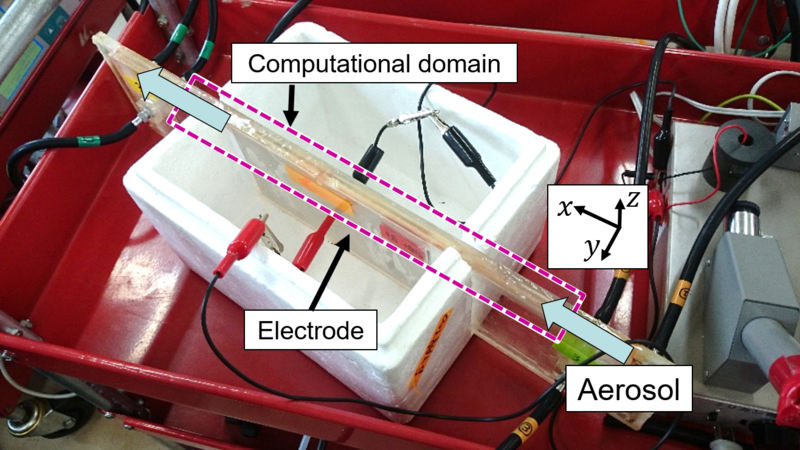 (2) Ali, M., Reddy, R. N. and Mazumder, M. K., Electrostatic charge effect on respirable aerosol particle deposition in a cadaver based throat cast replica, Journal of Electrostatics, Vol. 66, No. 7-8 (2008), pp. 401-406. (3) Cohen, B. S., Xiong, J. Q., Fang, C. P. and Li, W., Deposition of charged particles on lung airways, Health Physics, Vol. 74, No. 5 (1998), pp. 554-560. (4) Forsyth, B., H Liu, B. Y., Romaym F. J., H Liy, B. Y. and Ronzay, F. J., Particle charge distribution measurement for commonly generated laboratory aerosols, Aerosol Science and Technology, Vol. 28, No. 6 (1998), pp. 489-501. (5) Majid, H., Madl, P., Hohmann, W. and Alam, K., Implementation of charged particles deposition in stochastic lung model and calculation of enhanced deposition, Aerosol Science and Technology, Vol. 46, No. 5 (2011), pp. 547-554. (6) Marra, W. D., Rodrigues, M. V., Miranda, R. G. A., Barrozo, M. A. S. and Coury, J. R., The effect of the generation and handling in the acquired electrostatic charge in airborne particles, Powder Technology, Vol. 191, No. 3 (2009), pp. 299-308. (7) Okuda, T., Yoshida, T., Gunji, Y., Okahisa, S., Kusdianto, K., Gen, M., Sato, S and Lenggoro, I. W., Preliminary study on the measurement of the electrostatic charging state of PM2.5 collected on filter media, Asian Journal of Atmospheric Environment, Vol. 9, No. 2 (2015a), pp. 137-145. (8) 奥田知明，郡司裕真，Lenggoro, I. W., Kelvin Probe Force Microscopyを用いたエアロゾル個別粒子の帯電状態の測定，エアロゾル研究，Vol. 30, No. 3 (2015b), pp. 190-197.